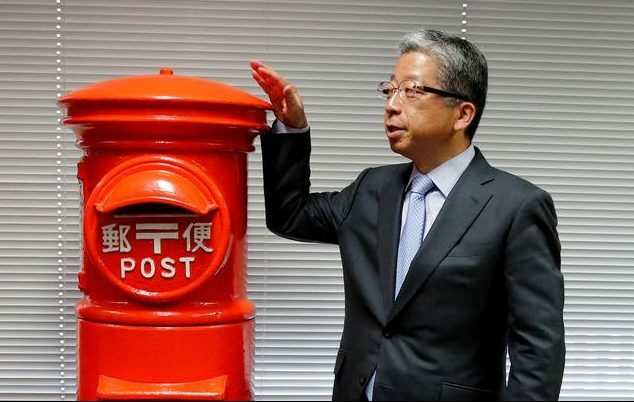 Japan Post Co new President and CEO Kunio Yokoyama poses with a post box for a photo after a group interview at the company's headquarters in Tokyo, Japan July 5, 2016. Japan Post Holdings, the postal operator and financial holding company, is selling up to 387 billion yen ($3.5 billion) of stock in its unit, Japan Post Insurance, according to a term sheet. The offering consists of up to 150.4 million shares including an over-allotment. That could raise 387 billion yen based on JPI’s closing share price of 2,575 yen on the April 8 morning close. Japan Post currently owns 89 percent of JPI. Japanese investors have been allocated 70 percent of the offering. The remaining 30 percent will be sold to international investors. The sale is the first of JPI stock since its initial public offering in October 2015 and is expected to help further move forward the privatisation of the Japan Post group, JPI said in a statement on April 4. The roadshow will run from April 8 to April 12. The offering will be priced between April 15 and April 17. JPMorgan, Daiwa and Mitsubishi UFJ Morgan Stanley Securities are acting as joint global coordinators of the international tranche of the offering.